If you have ever wanted to learn Latin ballroom dancing, but don’t have a cooperative partner this venue is perfect for you! Learn the basic steps of the samba, cha cha, mambo, merenge, rumba , etc. choreographed into an interesting pattern that requires no partner. 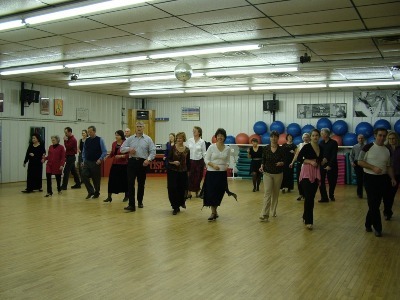 Ballroom Line Dancing is designed to teach students not only the basics of Ballroom Line Dancing, but also the basic fundamentals of a variety of Ballroom Dances, primarly rhythem (Latin) dances, without the concern about leading or following your partner. It is a collection of choreographed series of steps performed by a group of dancers assembled inline, which involves a variety of walking, swiveling or turning movements done to the music of many Latin dances such as Cha Cha , Mambo, Samba, Rumba, & Merengue. After mastering the foot work of the steps you will have easier time adapting the patterns you have learned with your partner, along with applying the fundamentals of leading and following. Ballroom Line Dancing is great for SINGLES. It can be performed by individuals or groups.